No two states are alike when it comes to liquor laws, and most are changing from year to year. Tennessee’s wine in grocery stores law puts it in line with neighboring states. Bar closing time: Mon-Sat 8 a.m. – 3 a.m.; Sunday Noon – 3 a.m.
Monday to Saturday: 8:00 a.m. to 11 p.m. Sunday: Only beer (not wine or liquor) can be sold. Wine sales in Tennessee retail food stores began at 8 a.m. on July 1, 2016. Sales are allowed Monday through Saturday, 8 a.m. to 11 p.m. No wine sales are allowed on Sundays, although beer sales are. No sales are allowed on five holidays: New Year’s Day, July 4, Labor Day, Thanksgiving and Christmas Day. Buyers must be at least 21 years old and store clerks selling must be at least 18. 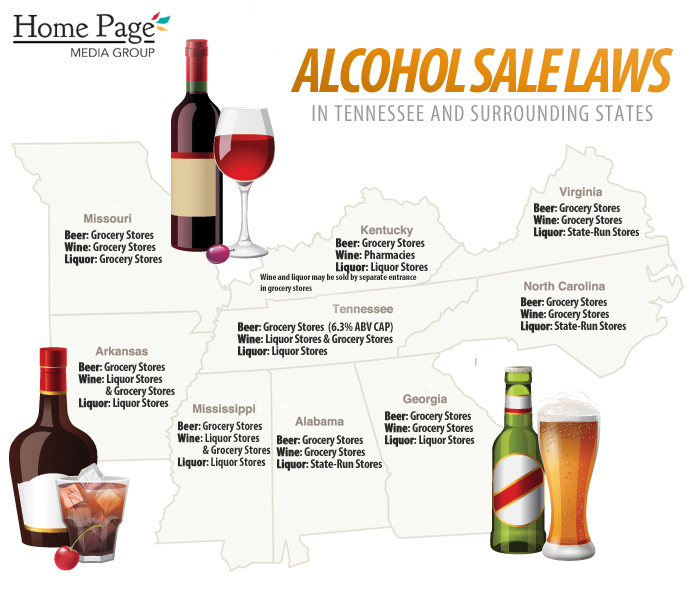 The state agency regulating grocery store wine sales is the Tennessee Alcoholic Beverage Commission. Wine: Pharmacies. Wine and liquor may be sold by grocery stores, but only through a separate entrance to that part of the store. Liquor: Liquor stores. Wine and liquor may be sold by grocery stores, but only through a separate entrance to that part of the store. (NOTE: 39 of Kentucky’s 120 counties are dry). Additional Notes: Beginning in 2013 Liquor by the drink and beer by the drink are available on Sundays in Louisville, KY beginning at 10 a.m. Bowling Green, KY recently began allowing Sunday sales in December 2013 for carry-out beer, wine, and liquor. Prohibition on liquor sales on Election Day was repealed effective June 24, 2013. Kentucky was one of only two states to still have Election Day prohibition, the other being South Carolina. Bar closing time: Most establishments (Mon-Sat) 6 a.m. – 1:30 a.m.
Special licenses in Kansas City and St. Louis: (Daily) 6 a.m. – 3 a.m.
Off-Premise Sale Hours: Monday to Saturday: 6 a.m. to 1:30 a.m.
Special licenses available for bars and nightclubs which allow selling alcohol until 3 a.m. in Kansas City, Jackson County, North Kansas City, St. Louis, and St. Louis County. Grocery stores, drug stores, and gas stations may sell liquor without limitation other than hours. Patrons allowed to take open containers out of bars in Kansas City’s Power & Light District. Wine: Liquor stores ***Arkansas wine can be sold at grocery stores. Sunday: Some cities allow off-premise sales on Sunday. Distribution is not state-controlled. Additional notes: Half of Arkansas’s counties are dry, but private clubs are exempt from this. Christmas Day sales are prohibited. Alcohol sales are generally prohibited on Sundays, but exceptions can be made through local option (usually for restaurants and private clubs). 15% ABV cap on beer, 16% cap on unfortified wine, 24% cap on fortified wine. Sunday restrictions? Bars and stores cannot sell alcohol until 12:30 p.m. Allowed only by local referendum. Off-Premise Sale Hours: Off-premise sales times are determined at the county level, not state. Additional notes: The sale of alcohol on Sundays was not allowed in Georgia until 2011. In a statewide election, each county voted whether to end the Sunday ban. 105 of the 159 counties chose to repeal the law. Beer with ABV above 14% is illegal. In certain areas public consumption is legal, but has the following limitations: One drink on street, size no more than 16 oz, drinking from a can, bottle or glass is prohibited. 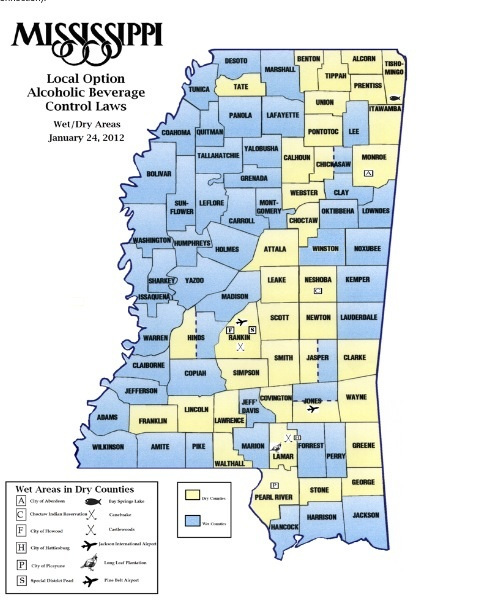 Most municipal corporations and political subdivisions limit the possession of open containers of alcohol to private property, with the exception of Savannah and Roswell. Off-Premise Sale Hours: Sunday to Saturday: 6 a.m. to 12 a.m. except local Blue Law. Monday to Saturday: 10 a.m. to 9 p.m. Sunday: 1 p.m. to 6 p.m.
Additional Notes: Virginia bars must make at least 45% of their revenue from food sales. Therefore there are no strict “bars” in the traditional sense – every establishment is a bar/restaurant. Licensed supermarkets, convenience stores, and gas stations may sell beer and wine. Off-premises sales no later than 12 midnight. Liquor stores are owned and operated by the Commonwealth and are generally open 10 a.m.-9 p.m. Monday-Saturday and from 1 p.m.-6 p.m. on Sunday. Bar closing time: 2 a.m.
Sunday restrictions? State-run stores closed. Prohibited between 6 a.m. and 12 p.m. on Sundays in some counties. Private clubs, which require a membership fee and a membership card, have no day or time restrictions. Sunday to Saturday: 6 a.m. to 2 a.m.
Additional Notes: 26 of Alabama’s 67 counties do not allow the sale of alcohol, though possession and consumption remains legal. Of the 26 “dry” counties, 23 have at least one “wet” city; these are considered “moist” dry counties. Within those 23 counties there are 43 wet cities. State law allows any city with a population greater than 1,000 located within a dry county to “go wet” if a referendum is passed by 50% of voters. State retains monopoly over wholesaling of distilled spirits only. Homebrewing beer became legal in all 50 states in 2013 as the governor of Mississippi signed a bill legalizing homebrewing on March 19, 2013 and as the governor of Alabama signed a bill legalizing homebrewing of beer and wine which came into effect on May 9, 2013. No state open container laws. Free alcohol all day and night in coastal casinos. Sale is prohibited on Christmas day. In most counties Sunday sales are prohibited. Homebrewing beer became legal in all 50 states in 2013 as the governor of Mississippi signed a bill legalizing homebrewing on March 19, 2013 and as the governor of Alabama signed a bill legalizing homebrewing of beer and wine which came into effect on May 9, 2013. The Mississippi bill went into effect July 1, 2013. Dry — All sales of alcoholic beverages are prohibited. Wet — Sales of alcoholic beverages for on-site or off-site consumption are allowed in at least some areas outside of an incorporated city. However, many “wet” counties have dry precincts. For example, Kentucky’s two consolidated city-county governments, Louisville and Lexington, are both wet, although a few precincts in Louisville are dry. Moist — The ABC uses this term strictly to refer to otherwise dry counties where one or more specific cities have voted to allow alcohol sales for off-premises consumption. Limited — A county in which at least some otherwise dry territory has approved the sale of alcohol by the drink at qualifying restaurants. Under this category, the ABC has secondary classifications of “Limited (100)” and “Limited (50)”, with the numbers referring to the seating capacity required for a restaurant to apply for a license. ABV — Alcohol by volume (abbreviated as ABV, abv, or alc/vol) is a standard measure of how much alcohol (ethanol) is contained in a given volume of an alcoholic beverage (expressed as a volume percent). ABW — Alcohol by Weight (ABW) is a measure of how much alcohol is in a beverage, expressed as a percentage of the total beverage weight. The US often quotes alcohol values by weight (not volume) and the Bureau of Alcohol, Tobacco and Firearms (BATF) uses the weight measurement. ^ Locker, Richard. “Hundreds of Tennessee Stores Approved for July 1 Wine Sales.” The Commercial Appeal. USA Today Network, 20 June 2016. Web. 28 June 2016. ^ Brammer, Jack (August 10, 2012). “Want to buy or sell an alcoholic drink in Kentucky? That’ll depend on where you are”. Lexington Herald-Leader. Retrieved August 24, 2012. ^ “Wet & Dry Counties in Kentucky as of 01/03/13” (PDF). Kentucky Office of Alcoholic Beverage Control. Retrieved January 25, 2013. Scheller, Alissa. “Here Are The Rules To Buying Alcohol In Each State’s Grocery Stores.” The Huffington Post. TheHuffingtonPost.com, 26 Aug. 2014. Web. 28 June 2016.